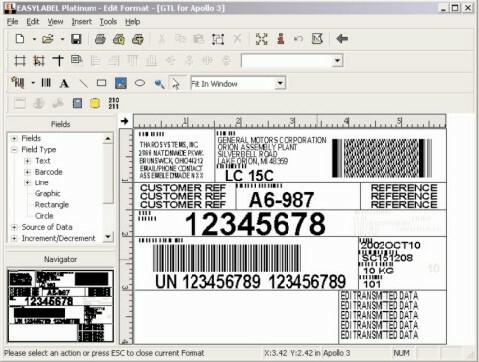 EASYLABEL PLATINUM 6 Barcode Labeling and Product Identification Software. Custom text formatting, ADO and OLE DB support, importing options, EAN/UCC 128 and RFID Wizard, command file processing, XML generator and ActiveX controls. USB License Key included. Designed with the user in mind, EASYLABEL 5 was derived from a comprehensive list of requests and suggestions from our customers. The idea was to take the stability, reliability and functionality of the current EASYLABEL products and implement a new, sleek and intuitive design to give EASYLABEL 5 a more Windows-like appearance. Basically, if you are familiar with today�s office applications, then you will feel very comfortable with EASYLABEL 5. Not only has the graphical user interface (GUI) changed, we�ve added many new and exciting features such as a Format Browser that makes finding specific fields much easier, an EAN/UCC-128 Wizard, an FDA 21 CFR Part 11 compliance toolkit, and the ability to design and print Multi-Lingual Hazardous Chemical labels. There was also a significant enhancement made to the database functionality. EASYLABEL 5 has an internal database editor that gives you the freedom to view and edit most any database from inside EASYLABEL 5! EASYLABEL 5 IS BETTER Simply stated, EASYLABEL 5 is easier. Unlike the �bargain� packages, EASYLABEL 5 includes every conceivable method of making label design easy, fast and accurate. 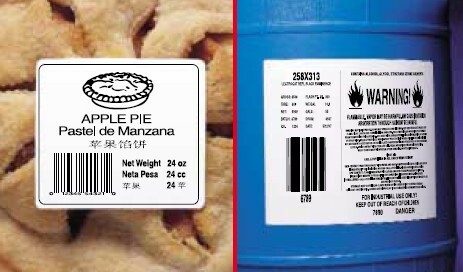 You don�t have to be computer literate to fulfill complex labeling requirements. The goal of EASYLABEL 5 is to make you productive, successful, and more effective. Basically, it does all the hard work for you, so you don�t have to. With the shortest learning curve in the industry, you�ll be making labels faster with EASYLABEL 5 than with any other labeling software package available. EASYTUTOR EasyTutor is a multimedia training companion to EASYLABEL 5. Its purpose is to help you gain a solid working knowledge of the features and functions of EASYLABEL 5 through movies and tutorials. � Print Queue - Unlike other programs that use the Windows� Print Manager, EASYLABEL 5 features a unique Print Queue that gives you the ability to manage your label printing jobs like no other program! 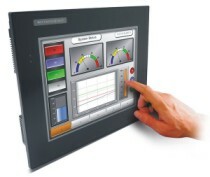 In a production situation, you can stage more than 200 print jobs and modify their priority for complete flexibility. Set up an entire day�s production at the start of a shift! The Print Queue provides an accurate picture of your print job status by showing the number of labels yet to be printed. You can also save all non-printing jobs in the Print Queue for future use, even if you exit EASYLABEL 5. Only EASYLABEL 5 gives you these powerful features! � Arithmetic - Using field names, literal values and mathematical operators, you can create complex equations quickly and easily. 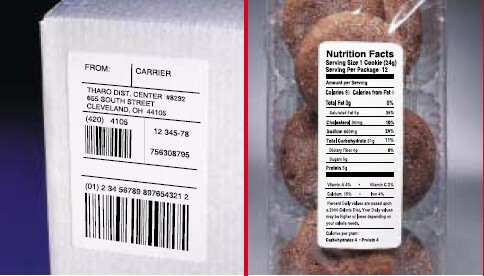 � Sell by Dates - Easily create sell by dates and date/time stamps for food and drug labeling. � Serial/Consecutive Numbering - For production or shipping control as well as serialized plates and ID tags. EASYLABEL 5 supports incrementing and decrementing in numeric, alphabetic, alphanumeric, hexadecimal and octal. You can also create your own custom increment sequences for your proprietary numbering system. � Thumbnail Preview - Allows you to view label formats, TrueType fonts and graphics giving you the ability to quickly and easily create and edit labels. � Languages - EASYLABEL 5 is available in English, Catalan, Czech, Dutch, French, German, Hungarian, Italian, Japanese, Polish, Russian, and Spanish. � Middleware Capabilities - With such powerful features as Command File Monitoring, 32-bit ODBC (Open Database Connectivity) and ActiveX/COM controls, you can effortlessly communicate with and control EASYLABEL 5. Printing can originate from an AS/400, mainframe, UNIX, or host system. A link to Visual Basic, Delphi, C, C++ and other applications that support ActiveX facilitates the creation of custom screens, entry boxes and controls. By using EASYLABEL 5, you can connect to MRP II (Manufacturing Resource Planning), ERP (Enterprise Resource Planning) systems such as SAP, Oracle, PeopleSoft, JD Edwards and BAAN, as well as MES (Manufacturing Execution Systems). � Terminal Server - EASYLABEL 5 Terminal Server provides you with all of the features that the Platinum version offers with the ability to be run on the Windows Terminal Server platform (Remote Desktop Services). The software and hardware key are only installed on the Server. This makes the management of the software a SNAP! 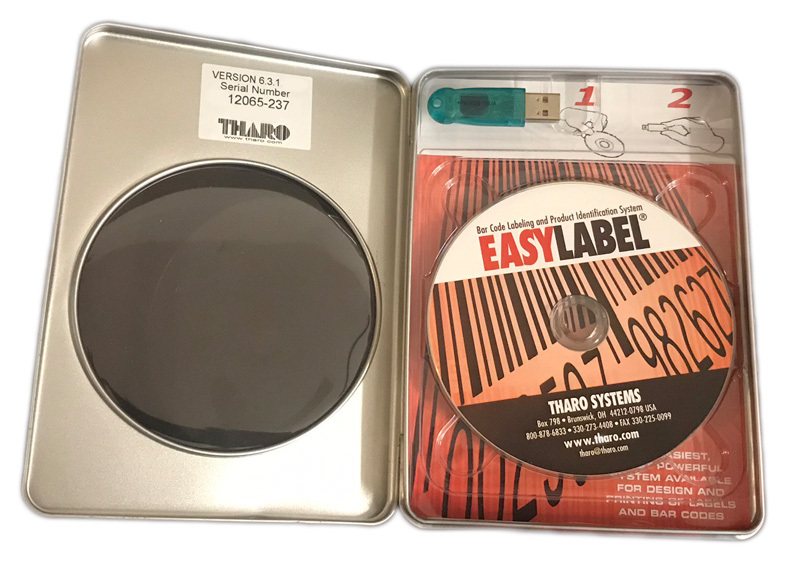 � RFID - EASYLABEL 5�s RFID Wizard will allow you to program and print High Frequency (HF) and Ultra High Frequency (UHF) smart labels. The RFID Wizard will also assist you in creating an Electronic Product Code (EPC) and allow you to import the data to be programmed on the smart label from numerous sources. � EASYLABEL 5 supports Microsoft�s ActiveX� Data Objects (ADO). The ADO database client provides you with the fastest, easiest and most productive means for accessing all kinds of data sources including relational and non-relational databases. � Using the ADO database client in EASYLABEL 5, you can connect to external databases such as Oracle�, Informix�, Paradox�, Btrieve�, Microsoft Access�, AS/400�, or any other database for which a driver or provider exists. ADO even allows you to access your non-relational databases. � Databaseview is a new database editor that has been incorporated into EASYLABEL 5. This new editor natively supports the Microsoft Access� structure allowing you to edit and create Access databases from within EASYLABEL 5. With the appropriate drivers you can view and edit almost any database structure including dBASE�, Paradox�, and Microsoft FoxPro�, as well as many popular spreadsheet and text formats. � dBASE� II, III, III+, IV and ASCII text files from another computer system can be read directly as a Source of Data for label printing. When using our internal database, you have the ability to retrieve any record in less than two seconds! � EASYLABEL 5 now provides you with the tools to design the most complicated chemical labels with certainty. If your task includes placing localized Risk and Safety phrases on your labels, EASYLABEL 5�s Database Cross Reference function will help you accomplish this. Using Database Cross Reference you are able to not only pull in data from one database but from a second, third or more. Database Cross Reference acts as a pointer that directs EASYLABEL to the database where the data is stored. � EASYLABEL 5 was developed to enhance and speed up your label design tasks. Our �ruler� on the design screen speeds up format layout. 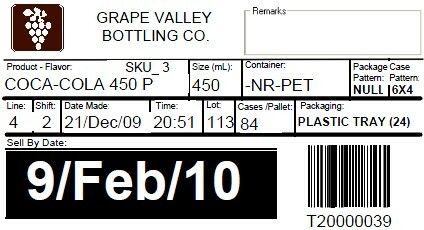 Functions like on-screen stretching, resizing of fields, extended crosshairs, snap to grid, multiple zoom levels and support for TrueType fonts (including the ability to adjust height and width of TrueType fonts independently) allow you to design, test print, proof and print labels faster and better than ever. � EASYLABEL 5�s new Graphical User Interface (GUI) employs a new, sleek and intuitive design that anyone familiar with today�s office applications will feel right at home using. � The appearance of EASYLABEL 5 can be changed to suit the requirements of individual users by customizing which colors are used in the program, and which toolbars are displayed. Program icons can be large or small and you have the option to display dialog boxes either tabbed or as a single style sheet. � EASYLABEL 5�s new Format Browser allows you to keep track of the fields that exist on a format. The fields can be located through an expandable �tree� structure where they are grouped by Field Type, Data Source, Conditional fields, Increment/Decrement fields, Hidden/Phantom fields, and TrueType/Device fonts. � EASYLABEL 5 supports UNC (Universal Naming Convention) taking the guesswork out of printing to a network printer. This allows you to print to any printer that is shared on a network, either within the local network or from anywhere in the world. � Use IP Printing (Internet Protocol) to print to a printer anywhere in the world, that is connected to a Print/Device server or Ethernet card, by using DHCP (Dynamic Host Configuration Protocol) or its IP address. � Connect to multiple printers by using a multi-port serial interface card such as DigiCard or RocketPort. By using such devices, EASYLABEL 5 can support over 128 COM Ports from one PC! � Support for two-dimensional bar codes such as Aztec, Codablock, PDF417, Micro PDF417, MaxiCode, DataMatrix, QR Code, and RSS-14/Composite. 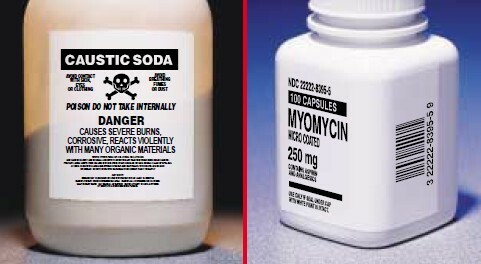 � Complies with FDA ingredient labeling requirements and Department of Transportation, OSHA, and local governmental regulations for hazardous material warning labels and �Right to Know�. EASYLABEL 5 natively supports over 200 thermal/thermal transfer printers including: Avery Dennison, C.Itoh, cab, Citizen, Datamax, Intermec, Novexx, Printronix, RJS, Sato, Synergystex, TEC, Tharo, TSC, Zebra. You can also print to any dot matrix, inkjet, laser or thermal/thermal transfer printer that uses a Windows Driver. EASYLABEL 6.00 and higher runs under all Windows operating systems of XP SP2 and later. All 64 bit systems are supported where applicable. Microsoft .NET framework 2.0 is required for the Platinum, Multi-User and Terminal Server (Remote Desktop Services) versions. Microsoft Internet Explorer 5.0 (or higher). Windows 2000 or higher is required for XML features. The need to conform to RFID (Radio Frequency Identification) standards and the growing use of RFID in general, requires software to correctly program and print smart labels. EASYLABEL� has the tools to meet and surpass these requirements. EASYLABEL�s improved RFID Wizard makes creating EPC (Electronic Product Code) and DoD (Department of Defense) smart labels child�s play. The RFID Wizard will prompt you for the necessary information and EASYLABEL will do the rest. RFID projects that do not require the EPC or DoD RFID code can use EASYLABEL to directly program HF (High Frequency) or UHF (Ultra High Frequency) smart labels in a hexadecimal or ASCII format. With EASYLABEL, you have the option to import parts or all of your RFID data from sources such as: databases, serial files, user input, existing bar code or text fields, and external text files. You may also choose to read the RFID data encoded in the RFID tags and print it on your smart labels as a text or bar code field. This feature can be used to comply with industry standards or as a human readable backup of the RFID data. An additional EASYLABEL RFID feature is the ability to write and print a report that includes the data used to program your printed smart labels. This report can then be used as part of an ASN (Advanced Shipping Notice), to keep a record of labeled items, or other company needs. Combining all of these RFID capabilities with EASYLABEL�s other time-tested features, will allow you to easily design, report, program, and print smart labels. Radio-frequency identification (RFID) is an automatic identification method, relying on storing and remotely retrieving data using devices called RFID tags or transponders. An RFID tag is an object that can be stuck on or incorporated into a product for the purpose of identification using radiowaves. Some tags can be read from several meters away and beyond the line of sight of the reader. 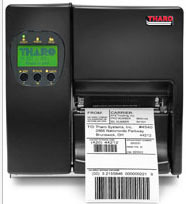 H626E THARO H-626E Series Thermal Transfer Barcode Label Printer. 203 dpi (8 dot/mm) resolution. Equipped with Thermal Transfer/Direct Thermal print mode with a 50.8 mm (2") ~ 168 mm (6.61") inch print width, and a 13 mm (0.51") ~ 2997.2 mm (118") inch print le ..
EL6M-USB-03 EASYLABEL MULTI-USER 6 Barcode Labeling and Product Identification Software. Custom text formatting, ADO and OLE DB support, importing options, EAN/UCC 128 and RFID Wizard, command file processing, ActiveX controls and network support. USB or Parallel Por ..
EL6PO-USB EASYLABEL 6 PRINT ONLY Barcode Labeling and Product Identification Software. Multitasking, serial/consecutive numbering, thumbnail preview and a variety of languages. USB License Key included. Print Only Key can ONLY be used with EasyLabel Platinum. ..
EL6G-USB EASYLABEL GOLD 6 Barcode Labeling and Product Identification Software. Custom text formatting, unlimitted fields on a format, ADO and OLE DB support, importing options and EAN/UCC 128 Wizard. USB License Key included. ..
EL6S-USB EASYLABEL SILVER 6 Barcode Labeling and Product Identification Software. Custom text formatting, 25 fields on a format. USB License Key included. ..
> SOFTWARE > BARCODE ADVANCED-EASYLABEL : 4 Items found. EASYLABEL 4 PARALLEL Port Replacement key. 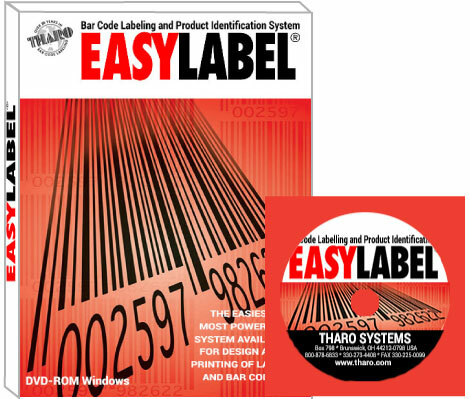 EASYLABEL 6 PRINT ONLY Barcode Labeling and Product Identification Software. Multitasking, serial/consecutive numbering, thumbnail preview and a variety of languages. USB License Key included. Print Only Key can ONLY be used with EasyLabel Platinum. EASYLABEL MULTI-USER 6 Barcode Labeling and Product Identification Software. Custom text formatting, ADO and OLE DB support, importing options, EAN/UCC 128 and RFID Wizard, command file processing, ActiveX controls and network support. USB or Parallel Port License Key included. EASYLABEL TERMINAL SERVER 6 Barcode Labeling and Product Identification Software. Custom text formatting, ADO and OLE DB support, importing options, EAN/UCC 128 and RFID Wizard, command file processing, network support and tools for FDA 21 CFR Part 11. USB License Key included.